Fall is officially here! Though we had a tough time bidding summer farewell, we are thrilled at the prospect of a new season filled with vibrant colors, warm apple cider and plenty of pumpkins. Visiting a pumpkin patch or an apple orchard is a beloved tradition here in Ohio, as it allows us to soak up some autumn sunshine, take a hayride and gather some amazing fall bounty. 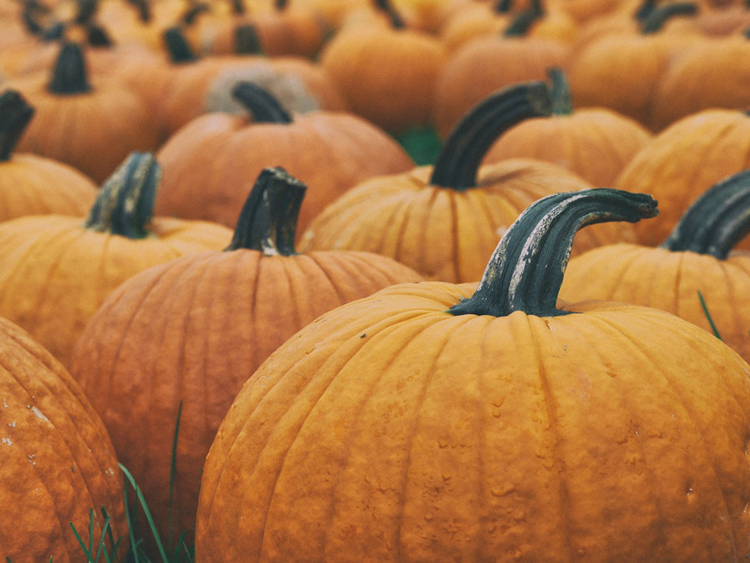 Whether you’re looking to gather some apples for making pie, pick-your-own pumpkin to carve into a jack-o-lantern or simply wanting to enjoy some good old-fashioned family fun, these local orchards and patches should provide you with some incredible fall memories. Enjoy! If you make the hour-long journey to Bauman Orchards in Rittman, you will be treated to more than 40,000 apple trees and 18 different varieties (10 available to pick yourself). Visitors can pick their own apples from September 1 through October 13, and afterwards, are invited to enjoy fresh-pressed apple cider (and maybe a few baked goods) in the market. Looking for a pumpkin, gourd or squash for eating or decorating? You can find those in the market as well. Tip: Don’t miss the Fall Festival on September 22, September 29 and October 6! There will be pick-your-own apples as well as live music, pony rides, a hay maze, homemade caramel apples, a petting zoo and more. Since 1955, the family at Beriswill Farms has grown and raised a wide range of agricultural products including corn, soybeans, vegetables, pumpkins and cattle. During the fall months, you can come get lost in the giant corn maze and pick the perfect pumpkin to carve! A day full of family fun awaits you at Brasee’s Corn Maze and Pumpkin Patch. The farm is open this fall on Fridays, Saturdays and Sundays from September 15 to October 29, where you can get lost in the eight-acre maze, explore the petting zoo, enjoy a cup of cider and pick the perfect pumpkin to carve at home. Derthick’s Corn Maze is a favorite amongst northeast Ohio families for a number of reasons — the gigantic and ornate maze, the cow train, the two 300-foot ziplines, and the pick-your-own pumpkin patch are just a few of those reasons! Come see what all of the fuss is about starting opening day (September 14) and on weekends through the end of October. Hillcrest Orchards strives to grow the highest quality apples, the largest pumpkins, the juiciest peaches and the happiest family memories. On weekends during the fall, you will be treated to a fun wagon ride out to the apple orchard or pumpkin patch, as well as sage picking advice to help you harvest the cream of the crop. Make sure to check the 2018 ripening calendar before planning your visit. Mapleside Farms is nothing short of idyllic. The orchard is set on rolling hills and includes more than 4,000 apple trees with 17 different varieties of apples. For this reason, it’s a popular destination for stocking up on fruit, but the venue also hosts concerts and other fun community events year-round. It’s a great destination for building new seasonal traditions — watching the fall sunsets, enjoying hayrides or digging into a freshly baked apple pie! This family-owned market is a favorite year-round, but especially during the fall months. 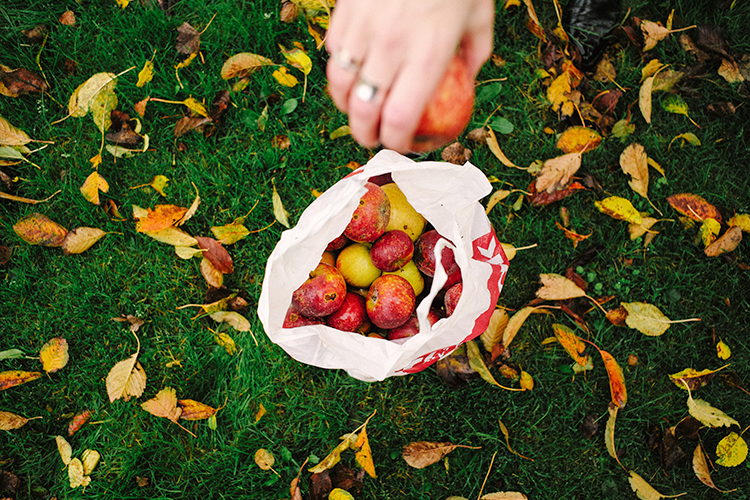 Starting in September, bring the family and pick-your-own-apples in the scenic orchards. After you have picked your fill, peruse the market for fresh pastries, baking supplies and more. 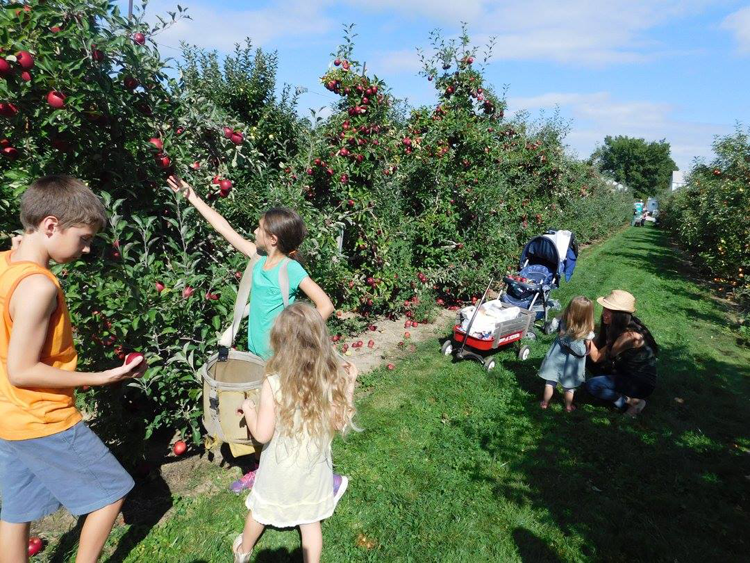 The Apple Pickin’ Spree on September 29 offers free admission, wagon rides, great food, crafts and pick-your-own apples. Pumpkin Land (set up throughout the fall) includes fun photo opportunities and a large play area for the kiddos. Monroe’s Orchard is a must-visit location for families looking for a fun day out in the sun. You’ll find fresh fruits year-round, but it would be a shame to miss the sight of the bountiful apple orchards and the pick-your-own pumpkins during the fall months. The Apple Harvest Festival begins on the last Saturday of September, and is also when the pumpkins are available! The team at Patterson Fruit Farm enjoys providing food for their local community and sharing the farming experience with families who stop by for a day of adventuring! 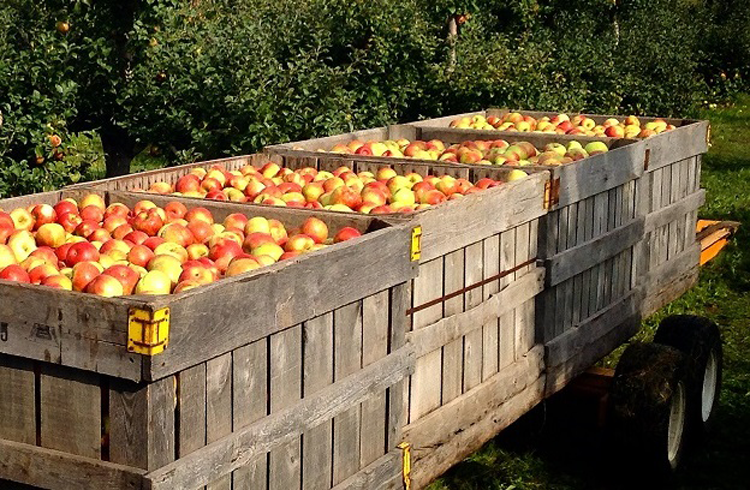 During apple season (August through early winter), the farm invites you to take a wagon ride and pick-your-own apples from more than 30 varieties grown on site. And if you’re looking for a true dose of seasonal fun (and maybe a pumpkin or two), Fun Fest runs from September 15 through October 28. The festival boasts a full lineup of family-friendly activities, including horse-drawn wagon rides, giant haystacks, a corn maze, pumpkin painting and more! Most of the customers at Pick ‘n’ Save Orchard are regulars that return year after year. This is likely due to the unparalleled hospitality and family-friendly environment that has become tradition here. The farm is a wonderful destination for fruit picking year-round (raspberries, blueberries, strawberries, oh my), but the apples are the main event. Stop by between 10 a.m. and 4 p.m. Tuesdays-Sundays to see for yourself! Red Wagon Farm is known for its incredible selection of local produce, which (depending on the season) includes pick-your-own strawberries, peaches, sweet corn, tomatoes and more. During the fall months, don’t miss the pumpkin festival, which runs on weekends from September 22 to October 28 this year. Activities include wagon rides, a corn maze, face painting, delicious food, and a selection of seasonal homegrown produce in the market — including pumpkins, of course. 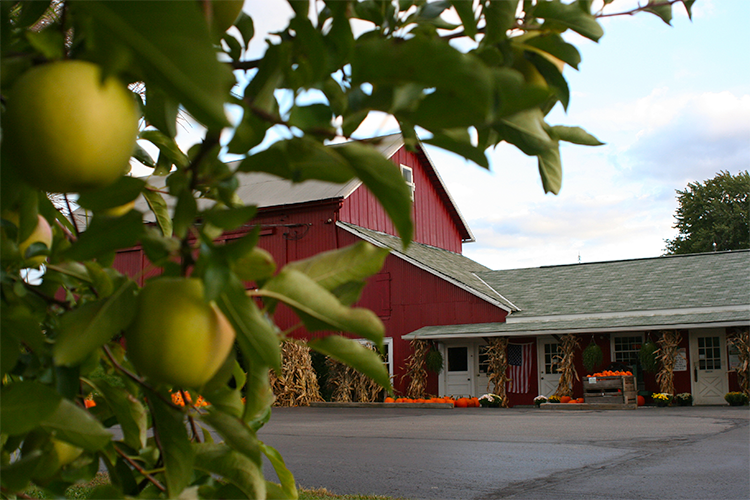 Rittman Orchards has a reputation for being one of the most fun (and most scenic) destinations in the fall! The market (open year-round) offers a wide variety of baked goods and fresh produce, but fruit-picking is the real draw of this location. Strawberries, peaches, apples and more are all available for you to grab straight from the source. View the apple chart to see what’s ripe. Sage’s Apples is celebrating its 151st anniversary this year and it’s no surprise why it has been so successful for so long! The farm grows more than 50 varieties of apples and sells a wide range of fresh produce in its market year-round. While you aren’t actually able to pick-your-own apples at this location, the market offers several delicious varieties that you won’t be able to find anywhere else, as well as a spectacular selection of melons, berries, peppers, corn and other local fruits and vegetables. It’s certainly worth a visit! Do you have a favorite spot you frequent this time of year? Share them with us in the comments!